Traverse the dark realms of heaven and hell in a PS4 remaster of the brutal PS3 action-RPG. Awakened by the End of Days, Death, the most feared of the legendary Four Horsemen, embarks upon a quest to restore mankind and redeem his brother’s name. Become Death himself, endowed with the ability to destroy entire worlds, and battle forces beyond Heaven and Hell as you explore a vast open world. Refine your playstyle as you go, taking advantage of a full leveling system, skill trees and a huge number equipment combinations to make Death your own. The Deathinitive Edition includes all previously released DLC and add-ons along with a range of visual and gameplay upgrades. 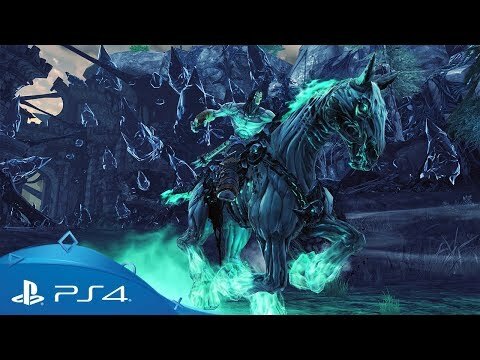 Buy Darksiders II: Deathinitive Edition on PlayStation Store. Search for the secret of immortality alongside Lara Croft in Rise of the Tomb Raider for PS4. Dark Souls III on PS4. Get the latest from the official source of all things PlayStation.